Yesterday had great potential to be soul-sucking. I signed up to spend the day listening to David Whyte, a writer of prose and poetry I greatly admire. I chose to spend the day sitting and listening, which is a very hard thing for me to do. I do not sit and listen well to anyone who speaks for an hour, let alone a day. So I chose to simply sit. And listen. And play and doodle and draw while I was listening, to engage in parallel play, and see what would come to me. In reflecting on Lost, David Whyte remarked the forest is everywhere. It’s in the forest, of course, but it is equally in our workplaces, our families, and our cities. This is an essential part of the city making exchange: the more we pursue the work that fills us with passion, the more the city offers opportunities for us to follow our passion. 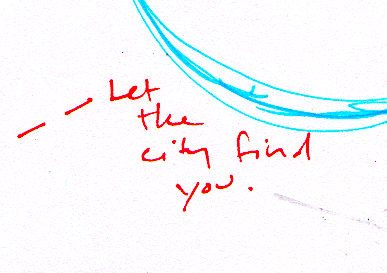 The city helps us find ourselves.